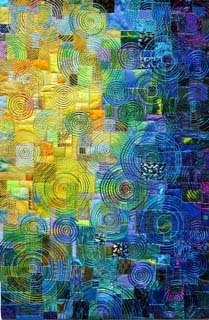 Carol Taylor’s Explosions in Color opens the fall season at The ArtQuilt Gallery·NYC. Running from September 9 through October 29, Ms. Taylor’s work is known for striking colors, emphasis on value relationships, and stunning contrasts. This quilt artist has won six “Best of Show” awards with 6 different quilts at leading national quilt exhibitions, and her quilts have been featured in many major magazines. Carol’s work is amazing. She is so talented. I’m tempted to do a road trip – Carol’s work is delicious! Way to go Carol !! Her work is spectacular, and I wish she would consider a traveling show to the Rocky Mountain Region.